Outside In are part of the Pledge 1% movement, we give 1% of of time and products and services to help good causes. The drive to do this for Parkinson’s UK research spurred me on. I am proud that my ride is contributing to a cause bigger than my own personal challenge. I have raised over £4,000 to help those suffering from the effects of Parkinson’s. It feels good to be part of their team and that the effort I put in is helping others. If you are a non-profit and feel our services could be of help please get in touch using the application form here. On the 8th September 2018 I sat on the start line for a totally awesome, yet challenging, adventure. Riding the length of the UK from Lands End in Cornwall to John O’Groats in Scotland. I was with another 700 people, ready to cover 980 miles, a lot of hills (like cycling up Everest twice) and camping every night for 9 days. I learnt a lot about myself in the 9 days that followed as we covered over 110 miles a day. In january I started to visualise finishing the event and thinking about what it will take to reach this goal. For me it was to complete 980 miles. It was not to do the distance quickly or in a specific time, reaching the line was enough. This meant that, despite being in the bottom 20% of riders each day, reaching John O’Groats was a total success for me. I’ll be honest here, I didn’t do enough of the right training to make this challenge easier. My bike skills were good, but the strength in my legs was not where it should have been for such a challenging ride. Some days were harder than others. 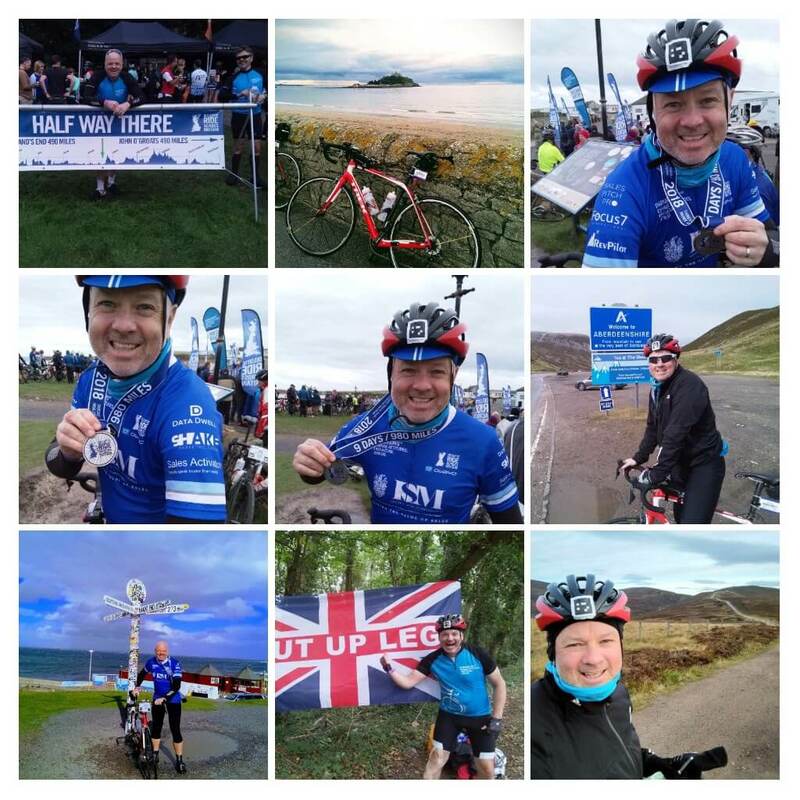 Days with lots of hills, or when it was icy or the final day when I completed the last 40 miles of my ride into John O’Groats in a single gear as the battery powering my gear shifters ran out. Doh! There is no doubt about it, this was an endurance event. There are some really tough moments throughout the ride. Starting out on a 2,000 foot climb after 50 miles on day 7 is tough on the legs for sure, but it is the mental toughness that saw me through. At the top of some of the major climbs a Union Jack flag could be seen fluttering in the wind. It said “SHUT UP LEGS” and this summed up how I felt at those times. There were times over the nearly 90 hours in the saddle when I was not not having a good moment. The friends I rode with encouraged me, supported me and helped me through those tough times. I would have found it much harder without their help. At the same time there were moments when I would be there for them. The organisers of the ride have a motto – ‘more is in you’. This fits so well with my experience and I had to push myself just that little bit further than I believed possible when I signed up. I am totally grateful for the support every one of my sponsors.